These easy-to-use under eye pads are the first eye masks that are safe to use for 8 hour. With the most natural potent antioxidants, skin will be refreshed and invigorated overnight. It uses as easy as peel, stick, and go to sleep. 1 Box of O2M Oxygen Eye Mask for all night repair (6 treatments/box). Minimize visible signs of aging around eyes. Reduce fine lines and wrinkles effectively. Instantly moisturize and soothe delicate under eye area. The oxygen eye mask helps get rid of dryness, puffiness, and dark circles! So before I gave you guys a review I used the entire pack just to make sure I knew how I felt! I’m going to be honest, when I read that you should wear these over night I was a little hesitant! Mainly because i’m weird about stuff being on my face and I assumed these would be super uncomfortable, I was wrong! These are very comfortable when worn correctly. I recommend placing them an inch or two under your eyes for them to be comfortable. The gel on the pads is very cooling and helps sooth the under eye! I didnt notice any burning or irritation which is huge for me since I tend to have very sensitive skin! They are also very sticky so you don’t have to worry about them falling off while sleeping! Personally I am all about age defying and preventative measures for the skin so I am obsessed with these! After several late nights of editing photos I would still wake up looking refreshed without under eye bags! These are definitely something I would recommend adding to your nightly skin care regimen. You can purchase these masks here! Who here has ever got something done for a special event and then you were like yea never going back raise of hands?!! Yea, I truly believe lash extensions are the gate way drug to hair extensions and vice verse lol. I got lashes for Mexico and thought ohh I'll just get them filled once, then maybe just one more time.... now it is a full on addiction! That is how I feel about hair extensions right now lol. Once they are in there is really no going back. I mean you could but then I wouldn't have the long luxurious locks! So since I got an overwhelming amount of people asking me what I thought about my hair extensions I want to give you all the deets!! A little break down for you guys! Cost; Around $600 depending on where you go and how many packs of hair you need! I got 2 1/2 packs! 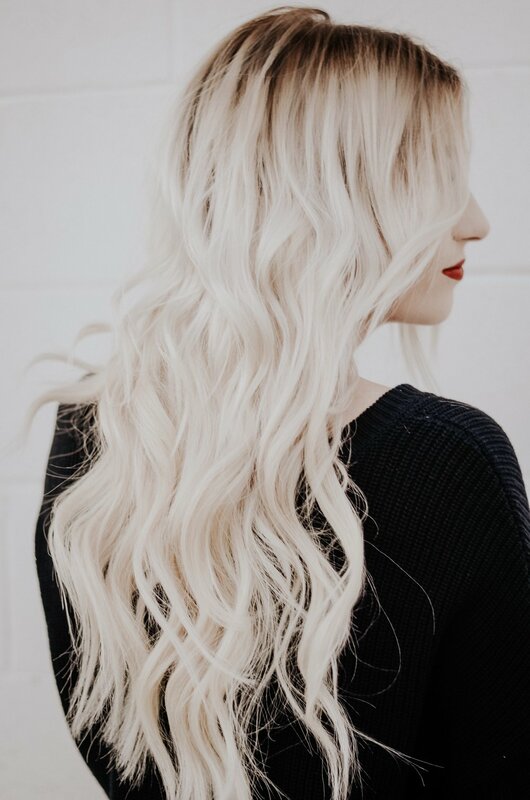 The extensions can last up to a year depending on how well you take care of them! You will need to have them moved up every 3-4 weeks depending on how fast your hair grows. I was told you need to wash your hair no more than 2-3 times a week and when you do you need a sulfate free shampoo! I got this one from Kerastase you also can't apply conditioner to your roots anymore just mid shaft to ends! After I finish showering I towel dry my hair and apply this elixir from Kerastase . You also have to completely blow dry your hair before bed or it's going to be a hot mess in the morning! I also braid the bottom of my hair before bed just to keep it from tangling up and causing breakage! Listen these are pricey and I want to get my moneys worth, which means I will handle with care! I also recommend getting a heat protectant! These babies are fragile and don't receive any oils like your natural hair does! So you will need to invest in a lot of good products! Kerastse is definitely my go to hair care system! I think anyone who has ever wanted extensions and has the time and energy to care for them I say go for it! I haven’t regretted mine at all! I love these because if you are someone with thin hair or thick hair, they can make them look like they grew out of your head! The blend is so seamless and perfect! You can't just wash your hair and go! You have to put some effort in and make sure they are dry before bed. If you have the time to care for them and the funds to keep up with them then go for it! Another great option if you are not 100% sure about Tape in extensions would be micro bead! My pretty friend Lauren is giving a full review on them over on her blog Fit Mommy In Heels! Hopefully between the two of us you can get a better idea which system works best for you! After applying all over I realized this is definitely not one of those cute selfie masks lol. This is my before and after and the major difference I could see was that it calmed down a lot of the redness that I had and my skin definitely looked more radiant! I finally finished my box of masks that @Influenster sent me to review for free! So I thought it would be the perfect time to review the product for you guys! While applying this mask I was very confused how this would dry and I would be able to peel off but it dries down to basically rubber! Also Pro tip make sure to apply A LOT!! It hurt to peel off on the places that had only a thin layer. A little info; I have oily to normal skin and my skin is very sensitive. So basically everything breaks me out. I was pleasantly surprised when I didn't receive any irritation from this mask. After removing the mask I could definitely tell that my skin looked a little more radiant and it seemed to calm down any breakouts I had coming. I think it does what it says I also think it would be even more beneficial to someone with dry skin! It is a little on the pricey side it retails for $80 at Sephora but for my girls that love luxury skin care this is right up your ally! You can shop this mask on my "shop my insta page"
I would describe this color as a mauvey rose color. I'm still not sure how I feel about the applicator! It's flat with square edges. Like I get that purpose the edge is there to line your lips, but I can do that with a normal applicator with a lot less trouble. But it smells like berries and I'm down for that. Looking at the tube and the description I was expecting a lot more of a punch. When you apply it's not completely opaque and it takes a couple swipes and dips to become opaque. It says it's Ultra Matte but I would describe the formula as a satin formula not Matte. So for those of you that hate the drying sensation that normal Liquid Lip formulas give then you will love this! It lasted from 9 until around 11:30 when I ate. So as long as you're not eating or drinking you should be fine but it's definitely not transfer proof. I would definitely purchase additional colors to use on those days that I just didn't want to apply a dry Liquid Lip! You can shop additional colors on my shop my insta page!